Your calves are typically tricky little blighters to train. They don’t tend to carry too much bulk and you have to work really hard to get them looking strong. However, that being said, if you do a couple of weeks of intensive calf training, you’ll soon see results. In bare feet stand with your feet slightly apart and then rise onto your tiptoes and then slowly put your heels back down to the floor. Repeat 100 times. Standing on the edge of a step, or staircase, have your heel hanging slightly over the edge. Raise up onto your tiptoes and then drop your heel back down again. Repeat until you feel the calves burning. Because of the 90 degree angle of your knees, this workout targets the soleus muscles, the broad muscles in the lower calf. If using the machine at the gym, then make sure the pads are snug to your knees and that your feet are on the block with toes pointing forwards. Raise as high as you can go until you are right on your tiptoes then hold and bring the heel down slowly. Again this will use a piece of gym equipment – namely the leg press. Sit in the machine and with your toes on the bottom of the footplate, make sure your heels are hanging off the bottom edge. Push the weight up with your feet until your knees are locked. Press up with your toes and balls of your feet and feel your calf muscles contract before lowering back down. 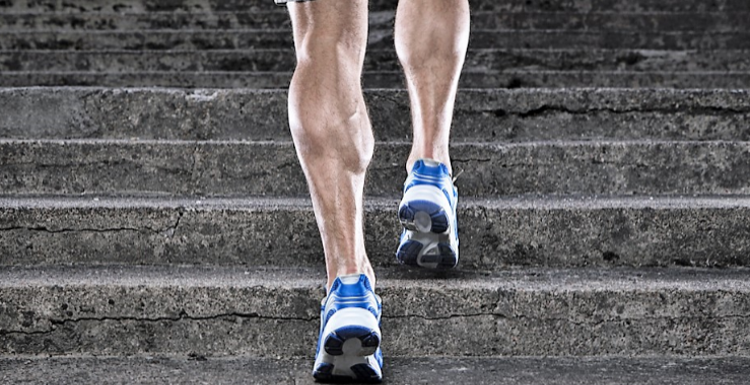 Doing calf raises, running up and down the stairs and doing any leg exercises with bare feet will help to work your calves better than if you are wearing trainers. Persevere with these five top tips and you’ll soon have better defined, stronger calves. I have a strained calf at the moment so can't do any of these. But any tips on exercises to heal my calf would be great.